Isolation Hangers, and Thrust Restraints. ISAT and Kinetics vibration isolation hangers and thrust restraints. There is NONE BETTER for Engineering services, manufacturing and testing capabilities - all backed by the industry’s most experienced staff. Designed to reduce the transmission of vibration and noise from suspended mechanical equipment such as fans, pumps, air handling units, piping and ductwork. Hanger inserts are designed for up to 50% overload capacity and for rod misalignment over a 30-degree arc. Brackets will carry 500% overload without failure. Available to 4” deflection and in capacities to 3,850 lbs. Spring hangers feature Kinetics patented No-Short spring cap which contains indexed steps to correspond to standard washer diameters for the appropriate rod diameter. Counteracts the discharge force created by fans during operation. 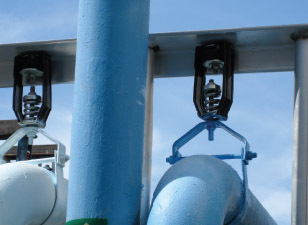 Always used in pairs, and best utilized when located on the centerline of the discharge outlet of the fan, bridging the flexible duct connector. 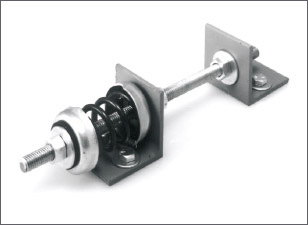 Uses 1” and 2” deflection springs in 35 to 3,500 lbs capacities.